Picha takatifu ya malaika mlinzi kutoka Urusi. Malaika mlinzi alivyochorwa na Pietro da Cortona, 1656. Malaika walinzi ni malaika wanaosadikiwa kuwa wametumwa na Mungu kulinda binadamu mmojammoja au katika makundi madogo na makubwa. Imani hiyo ni ya zamani sana, ilijitokeza tayari katika Ugiriki wa Kale na katika Agano la Kale na katika Agano Jipya, lakini ilistawishwa zaidi na Ukristo katika karne ya 5. Kalenda ya liturujia ya Kanisa la Kilatini inawaadhimisha Malaika walinzi tarehe 2 Oktoba. ↑ Catechism of the Catholic Church §336. ↑ In Genesis 18-19, angels not only acted as the executors of God's wrath against the cities of the plain, but they delivered Lot from danger; in Exodus 32:34, God said to Moses: "my angel shall go before thee." 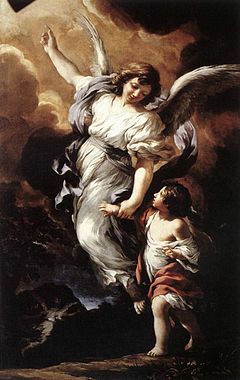 At a much later period, we have the story of Tobias, which might serve for a commentary on the words of Psalm 91:11: "For he will command his angels concerning you to guard you in all your ways;" (Cf. Psalm 33:8 and 34:5) The belief that angels can be guides and intercessors for men can be found in Job 33:23-6, and in Daniel 10:13 angels seem to be assigned to certain countries. In this latter case, the "prince of the kingdom of Persia" contends with Gabriel. The same verse mentions "Michael, one of the chief princes". ↑ In the New Testament the concept of guardian angel may be noted. Angels are everywhere the intermediaries between God and man; and Christ set a seal upon the Old Testament teaching: "See that you despise not one of these little ones: for I say to you, that their angels in heaven always see the face of my Father who is in heaven." (Matthew 18:10). Other examples in the New Testament are the angel who succoured Christ in the garden, and the angel who delivered St. Peter from prison. In Acts 12:12-15, after Peter had been escorted out of prison by an angel, he went to the home of "Mary the mother of John, also called Mark". The servant girl, Rhoda, recognized his voice and ran back to tell the group that Peter was there. However, the group replied: "It must be his angel"' (12:15). With this scriptural sanction, Peter's angel was the most commonly depicted guardian angel in art, and was normally shown in images of the subject, most famously Raphael's fresco of the Deliverance of Saint Peter in the Vatican. Hebrews 1:14 says: "Are they not all ministering spirits, sent to minister for them, who shall receive the inheritance of salvation?" In this view, the function of the guardian angel is to lead people to the Kingdom of Heaven. ↑ Compendium of the Catechism of the Catholic Church. Vatican, Retrieved on January 11, 2008. Joe Nickell. (2011). "On a Wing and a Prayer: The Search for Guardian Angels". Csicop.org. Ukurasa huu umebadilishwa kwa mara ya mwisho tarehe 16 Septemba 2016, saa 14:40.